The Republic of Armenia is a landlocked mountainous country in Eurasia between the Black Sea and the Caspian Sea, located in the Southern Caucasus. It shares borders with ► Turkey to the west, ► Georgia to the north, ► Azerbaijan with the break away republic of ► Artsakh to the east, and ► Iran and the ► Nakhichevan exclave of Azerbaijan to the south. More images Armenia - Armenia (Category). This section holds a short summary of the history of the area of present-day Armenia, illustrated with maps, including historical maps of former countries and empires that included present-day Armenia. Between 1500 - 1200 BC, states and tribes called Mitanni and Hayasa-Azzi existed in the western half of the Armenian Highland, often clashing with the Hittite Empire. Between 1200 - 800 BC, much of Armenia was united under a confederation of kingdoms, which Assyrian sources called Nairi ("Land of Rivers" in Assyrian). The Egyptians used Nairi for Mitanni, referring to the "Land of Rivers". Nairi was later absorbed into the kingdom of Urartu. The Armenian state of Urartu exists between the ninth and sixth century BC. The second map shows Urartu at its greatest extent in the time of Sarduris II, 743 BC. The following maps show the territorial development of Urartu between 860 and 585 BC. After the fall of Urartu around 585 BC, the Kingdom of Armenia was ruled by the Armenian Orontid Dynasty, which governed the state in 585 - 190 BC. Under Orontids, Armenia at times was an independent kingdom, and at other times a satrapy of the Persian Empire. 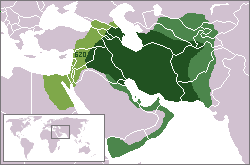 This map shows the Achaemid Empire (Persia (648–330 BC) at its greatest extent. More maps: Atlas of the Persian Empire. Armenia is conquered by the Macedonian Empire. More maps: Atlas of the Macedonian Empire. After the death of Alexander the Great, Armenia becomes part of the Seleucid Empire. Kingdom of Armenia around 300 BC under the Orontid Dynasty is most of the time a Seleucid vasal state. See also the next map. Kingdom of Armenia in 250 BC. After the destruction of the Seleucid Empire, a Hellenistic Armenian state was founded in 190 BC, with Artaxias becoming its first kings and the founder of the Artaxiad dynasty (190 BC - 1 AD). At the same time, a western portion of the kingdom split as a separate state under Zariadris, which became known as Lesser Armenia while the main kingdom acquired the name of Greater Armenia. At its zenith, from 95 to 66 BC, Greater Armenia extended its rule over parts of the Caucasus and the area that is now eastern and central Turkey, northwestern Iran, Palestine, Syria and Lebanon, forming the second Armenian empire. For a time, Armenia was one of the most powerful states in the Roman East. It eventually confronted the Roman Republic in a war, which it lost in 66 BC, but nonetheless preserved its sovereignty. Tigranes continued to rule Armenia as an ally of Rome until his death in 55 BC. This map shows Armenia between 189 and 63 BC. Later on, in 1 AD, Armenia came under Roman control until the establishment of the Armenian Arsacid dynasty. The Armenian people then adopted a Western political, philosophical, and religious orientation. For more maps see the Atlas of the Roman Empire. Armenia was often a focus of contention between Rome and Parthia. This map shows the Parthian Empire (250 BC-226 AD) controlling parts of Armenia. The Parthians forced Armenia into submission from 37 to 47, when the Romans retook control of the kingdom. Under Nero, the Romans fought a campaign (55–63) against the Parthian Empire, which had invaded Armenia. After gaining (60) and losing (62) Armenia, the Romans entered (63) into the territories of Vologases I of Parthia, and returned the Armenian kingdom to Tiridates, founder of the Arshakuni Dynasty. This map shows Armenia under the Arshakuni Dynasty. The Persian Sassanian Empire occupied Armenia in 252 and held it until the Romans returned in 287. In 387 the kingdom was split between the Byzantine or East Roman Empire and the Persians. Western Armenia quickly became a province of the Roman Empire under the name of Armenia Minor; Eastern Armenia remained a kingdom within Persia until 428, when the local nobility overthrew the king, and the Sassanids installed a governor in his place. For more maps see the Atlas of the Persian Empire. In 591, the great Byzantine warrior and Emperor Maurice defeated the Persians and recovered much of the remaining territory of Armenia into the empire. The conquest was completed by the Emperor Heraclius in 629. See for more maps the Atlas of the Byzantine Empire. In 645, the Muslim Arab armies of the Caliphate had attacked the country, which fell before them. Armenia, which once had its own rulers and was at other times under Persian and Byzantine control, passed largely into the power of the Caliphs. 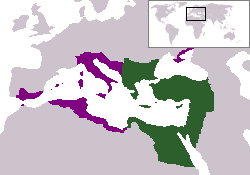 This map shows the expansion of the Caliphate: I: Muhammad; II: Abu Bakr; III: Omar and IV: Othman. See for more maps the Atlas of the Caliphate. This map shows Armenia under the Bagratuni Dynasty around 1000. This map shows changes in borders of the Mongol Empire from founding by Genghis Khan in 1206, Genghis Khan's death in 1227 to the rule of Kublai Khan (1260–1294). (Uses modern day borders). For certain times, Armenia was under control of the Mongols. Armenia is conquered under the rule of Selim II (1524 – 1574) by the Ottoman Empire. However, the initial accession begins with Mehmed II, who also offered the Ottoman support to initiate Armenian Patriarch in Constantinople. This rule continued 300 years till the following the Russo–Turkish War (1828–1829), when the Eastern Armenia of this territory was ceded to the Russian Empire. The remaining Ottoman Armenia, till World War I, under Ottoman rule was also referred to as Western Armenia. See for more maps the Atlas of the Ottoman Empire. The western part became part of the Ottoman Empire. Major Armenian extermination sites in the Ottoman Empire during the Armenian Genocide. In 1922 the Soviet Union is formed of which Transcaucasia and later Armenia becomes a constituent republic. See the Atlas of the Soviet Union. Turkish-Soviet frontier per the Treaty of Kars. Southern Armenia and Nagorno-Karabakh in Soviet Caucasus, 1930. Armenia regains independence in 1991. Map of Armenia in the colors of the Armenian flag. ↑ Romanization: Hayastan (Hayq)- Hayastani Hanrapetutyun.